Cuesta Rey Cigars is a brand owned by JC Newman and the cigars are expertly crafted in the Fuente factory in the Dominican Republic. There are three brands under the Cuesta Rey umbrella–Centro Fino, Cabinet Collection and Centenario. Cuesta Rey Cabinet Collection is a special line of cigars. Cuesta Rey Centro Fino has a filler made of expertly aged Dominican Tobacco, a Ligero-leaf filler blend. The binder used is also a premium Dominican tobacco. This is rolled in an Ecuadorian sun grown Sumatra-seed tobacco, using leaves picked from the center of the tobacco plant. This gives the cigar its name, Centro Fino or fine center. The smoke is creamy, with hints of oak, nuts and the rich Dominican Ligero filler. 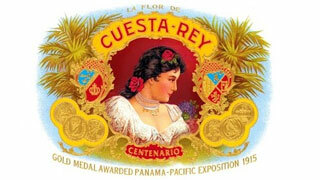 Cuesta Rey Centenario cigars have a filler blend of Cuban-seed Dominican tobaccos and a Dominican binder. The tobaccos are aged for fives years. The cigars come with a silky Connecticut Shade wrapper or a dark Maduro wrapper, which gives you a medium-bodied creamy smoke with undertones of nuts and wood. Cuesta Rey Cigars are royal cigars that were first made in the late 19th century and were the favorite cigars of a Spanish Monarch. The first in this line was Cuesta Rey Number 95 with an African Cameroon wrapper. Following its popularity, more cigars were added to the line with a Connecticut Shade wrapper and a Connecticut Broadleaf Maduro wrapper. You can light these flavorsome cigars after a long day at work and let their smooth, aromatic smoke gently caress your senses. The official cigar brand of Spanish King Alfonso XI, these cigars are worth the try!